By the summer of 1778, the Stockbridges had served in every major campaign in the eastern theater of the American Revolution, from Bunker Hill to Monmouth. At the latter battle, fought just ten days after the British evacuated Philadelphia in a move to consolidate their forces in North America, approximately twelve Stockbridges fought in several New England regiments, shoulder to shoulder with their neighbors in what was the largest, longest land battle of the entire war. An additional twenty more from other New England tribes and the Oneidas also fought with Washington at Monmouth. July saw the British ensconced in and around Manhattan while the American forces were camped at White Plains, just several miles north. 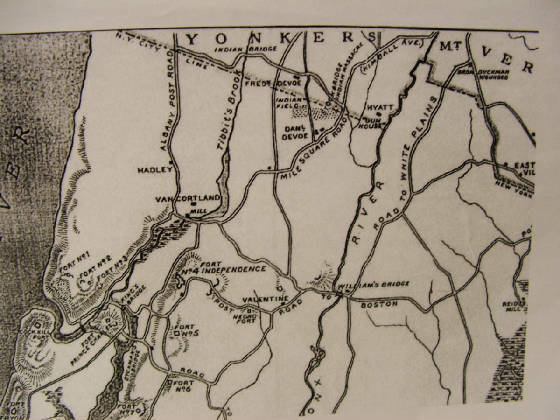 The area between the two armies, present-day Bronx and Yonkers, was indeed a dark and bloody ground, as patrols skirmished and ambushes plotted. On the British side, the best unit for such maneuvers was the Queen's Rangers led by young Colonel John Simcoe. This unit was the direct descendent of Rogers Rangers from the French and Indian War some twenty years earlier, and in fact, Rogers was the first commander of the Queen's Rangers during the Revolution. Consisting of loyalists, the regiment was formed into cavalry and infantry units, all clothed in short green jackets. While serving in the Bronx area, the regiment often worked in cooperation with Hessian troops. On the American side of the lines, the forward troops consisted of light infantry. These men were the shock troops of the Continental Army; lightly equipped and always ready to move quickly. They patrolled the no-mans land between the two armies during the summer of 1778. By early August, a group of Stockbridges under Daniel Nimham (the Wappinger sachem who moved his people to Stockbridge during the French & Indian War) joined the American army at White Plains. Abraham Nimham, seeking to fight alongside his father, requested of the army that all the Stockbridges from the several regiments be allowed to serve together. In addition to the Stockbridges, other Indians in the New England regiments were pulled out of their respective regiments to form the Indian Company under the command of Abraham Nimham. This combined Indian force served in conjunction with the light infantry. Thus the stage was set for a showdown between the loyalist Queen's Rangers, formerly Rogers Rangers, and the Stockbridges, formerly a vital element of that very same unit some two decades earlier. The Stockbridge Indians, about sixty in number, excellent marksmen, had just joined Mr. Washington's army. Lt Col Simcoe was describing a private road [DeVoe's Lane] to Lt Col Tarleton; Wright, his Orderly dragoon, alighted and took down a fence of DeVou's farm yard for them to pass through; around this farce the Indians were ambuscaded; Wright had scarce mounted his horse, when these officers, for some trivial reason, altered their intentions, and spurring their horses, soon rode out of sight, and out of reach of the Indians. Lt. Col. Simcoe, returning from head quarters, the 20th of August, heard a firing, in front, and being informed that Lt. Col. Emmerick had patrolled, he immediately marched to his assistance. He soon met him retreating; and Lt. Col. Emmerick being of opinion the rebels were in such force, that it would be adviseable to return, he did so. Lt. Col. Simcoe understood that Nimham, an Indian chief, and some of his tribe, were with the enemy; and by his spies, who were excellent, he was informed that they were highly elated at the retreat of Emmerick's corps, and applied it to the whole of the light troops at Kingsbridge. Simcoe was not one to let these incidents go unrequited. Towards the latter part of August, he devised his own ambush that would punish the Stockbridges.